David Erfle, Founder of The Junior Miner Junky joins me today to share his thoughts on the importance of risk management for metals investors. We review some of his recent trades which include shorting the gold stocks after the failed inverse head and shoulders breakout. Liquidity is also important to note for investors looking to trade the stocks. Click here to visit the Junior Miner Junky website. Can you give me your take on Scandium International Mining (SCYYF)? It is a rare earth mining company. Hi Charles, Stockcharts doesn’t offer it with that listing but it looks good using SCY.TO. If it gets past .24, it would add to the probability that .21 was the low. For clarity, if it goes straight to .25 but then pulls backs a few cents, I’d be a buyer. But that’s a conservative approach. It is actually a buy right now on the 60 minute chart. Thanks. I thought the longer term charts looked pretty good. Gold running out of steam. Is it rollover time once again??? It’s looking that way the last few days…..
Yep rollover time is at hand. Hopefully im wrong but that rally really wasnt much to write home about. Another tease by the yellow metal. The question is: Does gold give back most if not all its gains from this current rally? I saw that comment Matthew. I hope the technicals underpin gold at current levels. I will say that the hunch I stated at the end of last week (gold needing to hold the $1235 area otherwise downside momentum could kick in) is coming to fruition. I hope it proves me wrong. The 200/233 and 600 week MAs are very important so I can see why the bears were able to hold back the bulls for now. However, now that gold is significantly correcting following the move from 1184 to 1246, I don’t think the bears will be so lucky on the second attempt at those MAs. It would appear the dollar wants a crack at 100. I wonder how hard resistance will be to crack in order for it to get there? 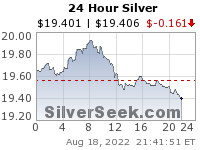 If it does strike parity, gold will break august lows I beleive. Maybe, maybe not. The problem with such assumptions is that parity means something different each time since the USDX is based on nothing but flawed currencies. For example, when gold bottomed at 1045 in 2015, the dollar was at parity but when the dollar hit parity +3 one year later, gold only dropped to about 1135. That’s almost 9% higher even though the dollar made a 3% higher high. Five or more years ago, many thought that parity would translate to gold well under 1,000. If parity is reached due to a weak euro more than a strong dollar, then gold should hold up surprisingly well. Yeh I agree but ultimately a dollar move to parity would be negative for gold unless it was happening during a safe haven bid. Your right as well with the notion of a weaker euro as opposed to a stronger dollar being positive for gold. Mind you, of late the inverse relationship between those 2 currencies has been so definitive that a weakness in the euro automatically correlates to similar strength in the dollar when one looks at their gains/losses from a percentage outlook. 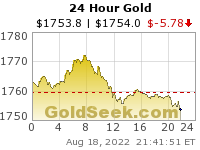 Yes, I don’t doubt that gold will weaken further if the dollar continues higher but it just might not weaken much. Notice on the chart posted at 6:00 pm that gold and the dollar went up together for the last month. That correlation has ended for now but could return quickly. Agreed! The dollar and gold going up together over the last month could well gave been that safe haven bid I referred to earlier brought on by the equities rout.